Following the critically acclaimed disc of Charles Ives songs, baritone Gerald Finley and pianist Julius Drake teamed up for this album of Samuel Barber songs. It reaffirms their position as a great singer-pianist duo. Finley has a beautiful instrument, backed by solid technique, dramatic commitment, and superb musicianship. He is perfectly suited to these songs. A great melodist and unabashedly romantic, Barber's way with a melody bears a strong kinship to fellow American Ned Rorem, and to Giancarlo Menotti, with whom Barber had a lifelong professional and personal relationship. At a time when others rushed to serialism, Barber stuck to a lushly lyrical style deemed to be regressive and old-fashioned. It is thus ironic that his contemporaries, having flirted with atonality, reverted back to a more traditional style. Sadly, Barber, who died in 1981, didn't live long enough to witness the pendulum swinging back his way. 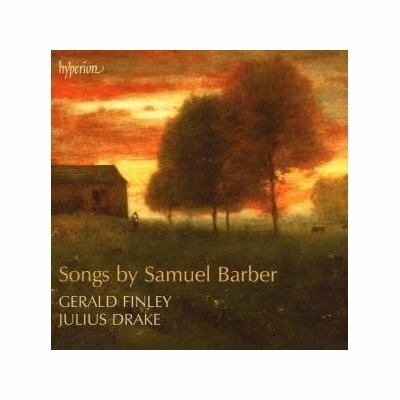 This disc contains 27 of Barber's best output, including Hermit Songs and Dover Beach, two of this three best song cycles. It's a pity that the third, Knoxville, Summer 1915, isn't included. Commissioned by Eleanor Steber, Knoxville is sung by a soprano and very occasionally by a boy treble. For once, I would love to hear a mature male voice in this! While Barber did not specify a voice type for Hermit Songs, it will forever be associated with the great Leontyne Price, who premiered it with the composer at the keyboard, and subsequently recorded it for RCA. It is refreshing to hear a baritone in this piece. Set to translations of Medieval Gaelic poems attributed to Irish monks, it has a disarming simplicity. Barber composed Dover Beach and sang the cycle himself on its first recording in 1935. Barber's skill and sophistication in the setting of this highly dramatic cycle on the loss of religious faith at the tender age of twenty is quite something. The composer dedicated Mélodies passagères Op. 27 to Pierre Bernac and Francis Poulenc. Composed in a distinctly French manner and derivative in style, it is as if Barber were deliberately imitating Poulenc. Finley sings beautifully throughout. His English is crystal clear, and his attention to textual details exemplary. Julius Drake is at the top of his game, offering excellent support. The recorded sound is warm and mellow. The beautifully produced booklet, with the trademark landscape oil painting on the cover, contains an essay, artist bios and song texts, except for the James Joyce items. Hyperion claims it is for copyright reasons, but it is probably because the Joyce Estate demanded money. This disc is a strong contender as the best vocal recital by a Canadian artist.